Achieving and maintaining a healthy weight can be challenging, especially in a modern society where food is constantly available. However, not eating enough calories can also be a concern, whether it’s due to intentional food restriction, decreased appetite or other reasons. Unfortunately, under-eating on a regular basis can lead to a number of mental, physical and emotional health issues. Here are 7 signs that you may not be eating enough. Calories are a measure of the units of energy your body uses to operate. However, when you don’t eat enough of them you’re likely to feel tired most of the time. The number of calories needed to perform your basic functions within a 24-hour period is commonly referred to as your resting metabolic rate. Most people have a resting metabolic rate of higher than 1,000 calories per day. Adding physical activity can increase your daily needs even more. Although hormones also play a key role in energy balance, generally speaking, the theory is that if you take in more calories than needed, you will store most of the excess as body-fat. If you take in fewer calories than needed, you will lose weight. Restricting intake to fewer than 1,000 calories daily can actually slow down your metabolic rate and lead to fatigue since you’re not taking in enough calories to support even the basic functions that keep you alive. Even light physical activity like walking or taking the stairs may cause you to tire easily if your calorie intake is well below your needs. Conclusion: Eating too few calories can lead to fatigue due to insufficient energy to exercise or perform movement beyond basic functions. Being hungry all of the time is one of the more obvious signs that you’re not eating enough food, especially the right types. Essentially, if your calorie intake drops too much, your body will send signals that drive you to eat in order to avoid potential starvation. Conclusion: Undereating can cause hormonal shifts that increase hunger in order to compensate for inadequate calorie and nutrient intake. Your body needs to burn a certain number of calories in order to create heat and maintain a healthy, comfortable body temperature. Therefore, if you are constantly feeling cold, not eating enough could be the possible cause. In fact, even mild calorie restriction has been shown to lower core body temperature. In a separate analysis of the same study, the calorie-restricted group experienced a decrease in T3 thyroid hormone levels, whereas the other groups did not. Overall, the more severely you slash calories, the colder you’re likely to feel. Conclusion: Consuming too few calories can lead to a decrease in body temperature, which may be due in part to lower levels of T3 thyroid hormone. Sleep deprivation has been found to lead to weight gain and even insulin resistance in dozens of studies. (15) In addition, while overeating may cause difficulty sleeping, it appears that strict dieting can lead to sleep problems as well. Conclusion: Undereating has been linked to poor quality sleep, including taking longer to fall asleep and spending less time in deep sleep. If little things have begun to set you off, it could be related to not eating enough. Irritability was one of several effects experienced by young men who underwent calorie restriction as part of the Minnesota Starvation Experiment during World War II. (19) These men developed moodiness and other symptoms while consuming an average of 1,800 calories per day, which was classified as “semi-starvation” for their own calorie needs. However, your own needs may be different, of course. To keep your mood on an even keel, don’t let your calories drop too low. Conclusion: Prolonged low calorie intake and restrictive eating patterns have been linked to irritability and moodiness. Infrequent bowel movements may be related to inadequate calorie intake. However, this shouldn’t be surprising, since consuming less food will result in less waste in your digestive tract. Constipation is typically described as having three or fewer bowel movements per week or having small, hard stools that are difficult to pass. This is very common in older people and can be worsened by poor diet. If you’re having problems with regularity, it’s important to take a look at the amount of food that you’re eating and evaluate whether you’re getting enough. Conclusion: Strict dieting and under-eating can lead to constipation, partly due to fewer waste products to form stool and slower movement of food through the digestive tract. 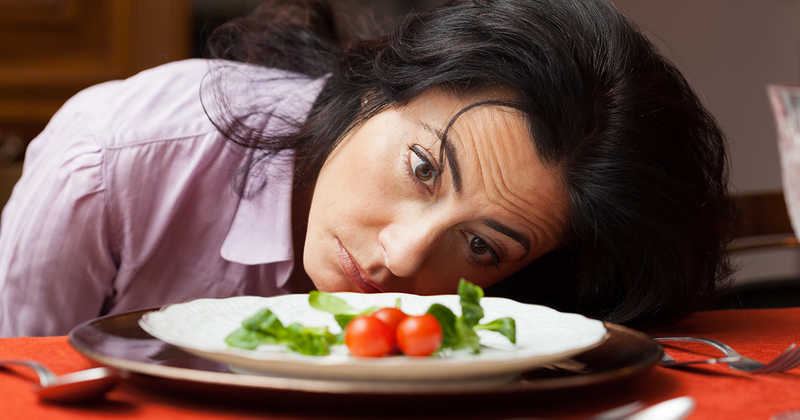 Although dieting itself may lead to moodiness, intense anxiety can also occur in response to very low calorie intake. Conclusion: Very low calorie intake may lead to moodiness, anxiety and depression in teens and adults. Although overeating increases the risk of developing health problems, under-eating can also be problematic. This is especially true with severe or chronic calorie restriction. Instead, to lose weight sustainably, make sure to eat at least 1,200 calories per day. Additionally, be on the lookout for the 7 signs outlined here that can lead to clues that you may be in need of more food than you’re currently taking in.